From L to R, (Top) Bro. Jack Cottrel, Bro. Larry Tuck, Bro. Kadir Olav, Bro Brian Staley, Bro. Mike Shipman, Bro. Adam Bernstein, Bro. Richard Jean-Louis, (Bottom) Bro. Brandon Sax, Bro. David Pierri, Bro. Robert Panisse, Bro. Greg Hovsepian, Bro. Glenn Donlon, Bro. Gregory Brenner, Bro. Robert Seneca, (blocked) Bro. Spencer Bushey. On Tuesday evening June 14, Officers, Brethren and guests gathered to partake of Paumanok-Port Washington Lodge No.855 Public Installation of Officers. Bro. 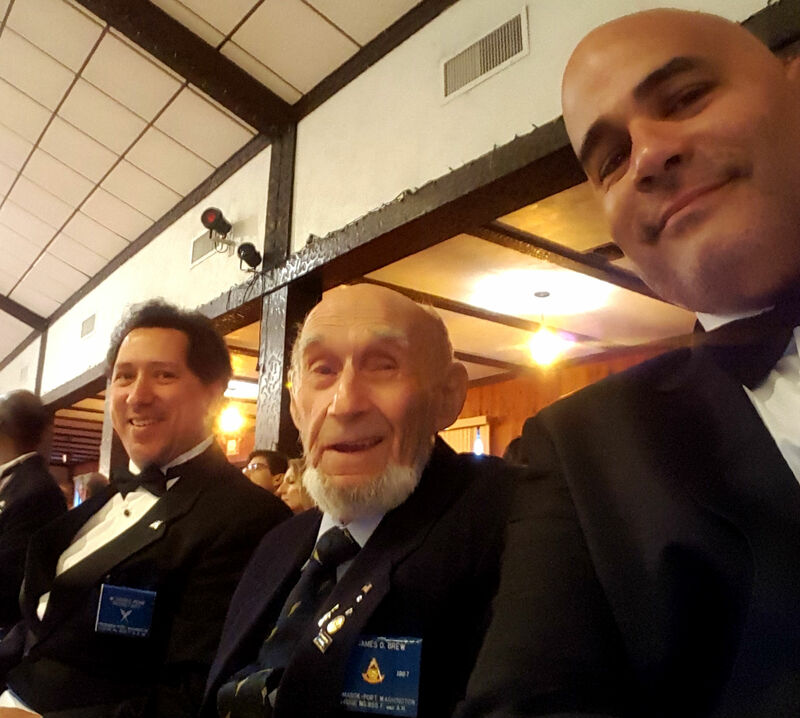 Greg Hovsepian was installed as Worshipful Master for the 2016-17 Masonic year by W:. 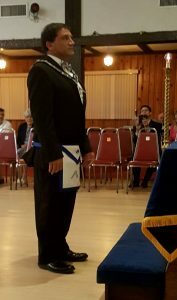 Adam Bernstein acting as installing Master. W:. Louis Enrique Saavedra representing Floral Park Lodge No. as well as W:. John Kubik representing St. Albans Lodge 5322, Province of Northumberland, England brought salutations and offered any assistance to the in-coming Master. V:.W:. Charles Schue as well as R:.W:. Jerry Curtis, Grand Lodge representatives were present and congratulated the newly raised Officers as well as congratulated the Lodge for its continued growth. The evening began with a cocktail hour which included mozzarella sticks and chicken tacos followed by a sumptuous buffet style dinner catered by Follow The Food, LLC which is run by Ian and Nadine Staley. The menu included a garden as well as a mixed green salad, fresh rolls, roasted Cornish hens, Marinated skirt steak, shrimp scampi, roasted red potatoes, fresh corn-on-the-cob, green beans and spaghetti. The installation began promptly at 8 after everyone had enjoyed their meals. At the end of the installation, Brethren and guests partook of a splendid layout of apple crumb cake, strawberry short cake, fresh fruit tort and vanilla ice-cream as well as tea and coffee. Everyone enjoyed the company and conversations kept going out into the parking lot. The officers would like to thank all the Brothers who helped on Sunday for the setup of the Lodge for the installation as well as the break-down at the conclusion of the installation. A big thanks also go to Irene Wierzbicki President of the Polish American Cultural Association for all of her help and assistance during the planning and execution of the installation as well as assisting Leon Jankowski bar-tending during the evening. Also to Ian and Nadine for their attention to detail and providing the Lodge with a phenomenal dietary banquet, looking forward to many more in the future.